Daystar KU09016BK Competition Bump Stop are made of high impact polyurethane with a slotted bolt hole spacing to allow for easy mounting. Carli Suspension Sway Bar Drop Bracket is meant for 2011 to 2013 Ford trucks to drop the entire sway bar brackets for proper geometry. Daystar's revoulutionary Airbag Cradle allow full travel of the suspension, while still being able to cary heavy loads with your air bags. Daystar's Airbag Cradle is the solution for maximun payload capacity and off road prowess. These kits are U-bolt upgrades for your rear leaf springs. These bolts will handle thicker than OEM leaf springs with some room to spare. OEM U-bolts may not fit to your new leafs so these are a great and easy option to make sure you're back on the road! Daystar - DAYKF09150BK - Ford Front Leveling Kit is made from Black Polyurethane to provide a 1" lift. Fox 2.0 Performance Series IFP smooth body shocks contain the latest in shock technology to transform the performance of your Truck or SUV. Fox 2.0 Performance Series IFP smooth body shocks contain the latest in shock technology to transform the performance of your Truck or SUV. Our Super Duty Starter System was engineering and developed to deliver a 4.5" Super Duty Lift, with massive gains in ride quality and comfort. Our Linear-Rate coil springs are built with a custom wind, giving them a smooth linear rate. Our design delivers subtle initial compression feel on highway chatter and small bumps as well as smooth compression deeper into the travel. Our Super Duty Starter System was engineering and developed to deliver a 4.5" Super Duty Lift, with massive gains in ride quality and comfort. Our Super Duty Starter System was engineering and developed to deliver a 4.5" Super Duty Lift, with massive gains in ride quality and comfort. Our Multi-Rate coil springs are built with a custom wind, giving them a progressive variable rate. Our design delivers smooth initial compression feel on highway chatter and small bumps. We designed our Adjustable Track Bar with a machined tapered rod end with a custom angle offset to increase ball joint life. Looking to adapt a coil over to your Super Duty? Our new coil over mounts make it easy to run a race quality shock on the front of your 05-08 Super Duty. Each mount is constructed out of 1/4" cold rolled steel for superior strength. 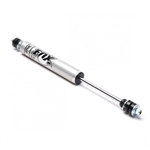 The Commuter Shock System is a custom tuned and blue-printed Fox 2.0 Shock built specifically for Carli Suspension with our own ride-quality tune.